Irtiqa: Even the history of blood transfusion can be exciting! 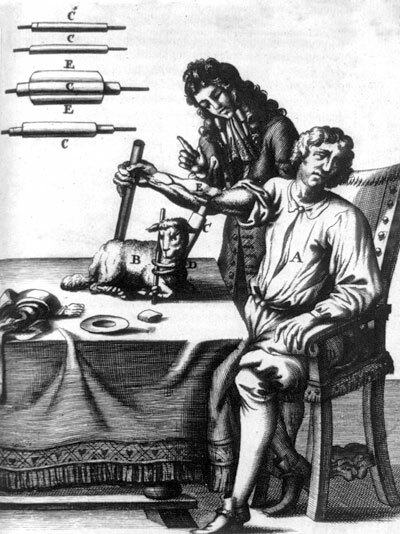 Even the history of blood transfusion can be exciting! 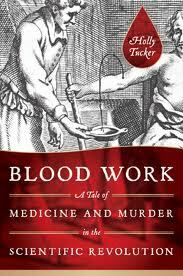 In Blood Work, medical historian Holly Tucker looks at the beginnings of transfusion in the seventeenth century. 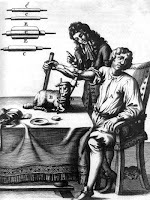 Adding material from her own archival research to the standard historical account, she fleshes out the start of physiological experimentation and examines historical attitudes to blood. The result is a page-turning insight into early scientific attitudes and disputes over priority. In the 1660s, she explains, the fellows of the newly established Royal Society of London began to transfer blood from one animal to another. This was part of investigations into the heart, blood, circulation and respiration, following William Harvey's seminal description of the circulatory system in 1628. The British group included Christopher Wren, Robert Hooke, Robert Boyle and Richard Lower, and their experiments were communicated throughout Europe by the secretary of the Royal Society, Henry Oldenburg, and published in the society's Philosophical Transactions. Meanwhile, the French Academy of Sciences opposed transfusion, so the main innovator in France was a marginal but ambitious physician, Jean-Baptiste Denis. He, too, began with animal-to-animal work, but quickly moved on to transferring blood between animals and humans. At stake was more than whether foreign blood was curative — people believed that the characteristics of the chosen animal might alter human personality. The docile lamb was the donor species most often used, with its religious overtones (Agnus Dei, or Lamb of God). “The blood is the life,” the Bible tells us, and seventeenth-century natural philosophers endowed that phrase with its full theological significance. Consequently, these were not simply experiments of curiosity; they were aimed at uncovering deeper meanings. That said, one of Denis's early subjects, a butcher, apparently took away his exsanguinated donor to roast. The early human transfusion patients in both countries were generally treated for what was perceived to be lunacy or other psychiatric disabilities. The first English subject was an eccentric clergyman who liked to converse in Latin. He survived an infusion of about a third of a litre of lamb's blood. Although it did not cure his language preference, he was less agitated afterwards. So the procedure was thought to hold enough promise to be repeated a couple of weeks later. Hopes were dashed when Denis transfused an agitated servant, Antoine Mauroy, with some calf's blood. The first two transfusions seemed to calm him. A third, insisted on by Mauroy's wife, was abandoned when the patient had a series of seizures. The next morning, Mauroy was dead, and was taken away for burial before Denis could perform an autopsy. 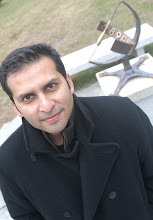 Tucker uses the competition between the French and English scientific societies as a window onto international rivalries during the scientific revolution. Claims over priority were at stake — being the first to successfully carry out a procedure mattered a great deal. In Paris, there was the additional tension between the Academy of Sciences, sanctioned by King Louis XIV, and the private groups that it effectively replaced. The fact that the French and English were at war during the 1660s adds spice to the story, as do London's 1665 plague outbreak and the Great Fire in 1666, which disrupted the early meetings of the Royal Society.